Glosses come in a range of styles and finishes, including everything from glorified lip balms to gels that make your lips look extra shiny. Youngblood Mineral Cosmetics is releasing a new summer line tomorrow that introduces the Mighty Shiny Lip Gel. But this gel isn't for the faint of heart. True to its name, it's one of the shiniest lip glosses I've tried. 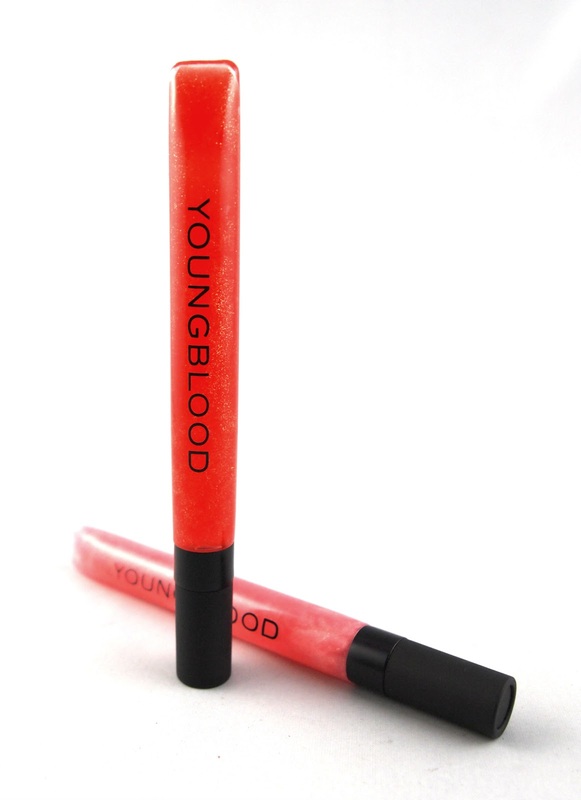 Youngblood's Mighty Shiny Lip Gloss comes in an array of fun colors, just in time for summer. I tried both Reveal, a subtle, almost clear shade and Displayed, which added a soft reddish hue. One of the best attributes of this lip gel is the fact that it has no discernible smell or taste. The consistency was great and didn't get sticky as it wore off. I also like how you can apply a smaller amount for a light shine or a greater amount for maximum shine. Also, it's worth nothing that the gels contain tiny, shimmery pieces of glitter. However, I was disappointed to see that these gels contain beeswax and may contain carmine, making them unsuitable for strict vegans. These ingredients are often found in natural cosmetic lines, but I hope to see them replaced with vegan alternatives in the future. The other ingredient that stood out was the Blue 1 Lake (CI 42090:2), as this particular item rates a 6 (moderate hazard) on the EWG Skin Deep scale and brings an otherwise low product rating up to a 5. Fortunately, this is a "may contain" product that might not even be present in all shades, but it's unclear which gels use this ingredient. Overall, I was happy with the performance of this gel and found it has a great texture. If you're at all nervous about trying it because the shades appear bright, don't worry because they are much softer when applied. While I'd love to see a vegan version in the future, this gel is a good cruelty-free alternative to many conventional glosses and is a nice option for the gloss addict. Ingredients: Polybutene, ethylhexyl palmitate, octyldodecanol, beeswax, ethylcellulose, isostearyl alcohol, hydrogenated dilinoleyl alcohol, glycerin, lecithin, c12-16 alcohols, palmitic acid, betaine, momordica grosvenorii fruit extract, simmondsia chinensis (jojoba) seed oil, ricinus communis (castor) seed oil, silica, calcium sodium borosilicate, trihydroxystearin, caprylyl glycol, vanilla planifolia fruit oil, limnanthes alba (meadowfoam) seed oil, prunus amygdalus dulcis (sweet almond) oil, ascorbic acid, tocopherol, flavor. May Contain: CI 77019, CI 77891, CI 77491, CI 77492, CI 77499, CI 45410:1, CI 15850, CI 15850:1, CI 19140, CI 42090:2, CI 75470.